Well lets see how this goes down, a clothes post! Just a disclaimer, I don't think I'm uber fashionable or anything I am just always so intrigued with what people wear - plus this way I can be told if I'm making any horrendous fashion faux pas. Also another reason is that I bloody love these shorts. I wore this a couple of days ago when I was popping into London to have dinner with a friend and see Goodbye First Love (said gal pal actually has a film blog where I think she will be reviewing it - here). It was raining and cold but wearing these shorts helped me kid myself it was summer. They were only £14.99 from H&M and they are really flattering as they are a really nice length and a little baggy. I hate having anything tight on my legs...it makes me uncomfortably conscious that I am wearing something quite short. As for make-up, I am wearing everything from my 'my face' feature but this time my lips are MAC Honey Love - review to come. I have linked to everything I can find online. 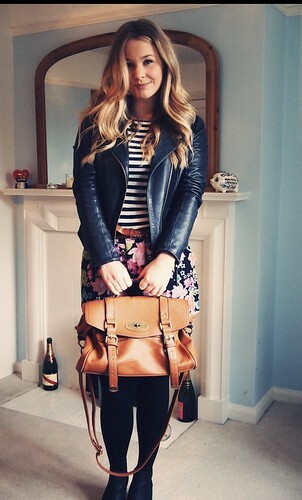 I love this outfit, you've totally nailed the stripes and floral combo - I may have to copy you! 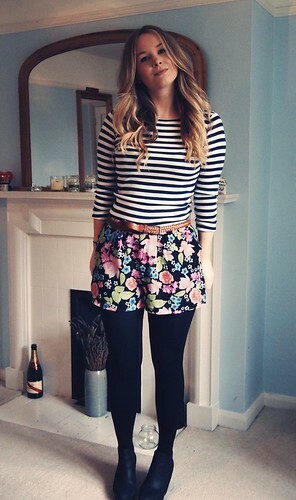 This outfit is so cute :) I love the mix of floral and stripes! Your hair looks amazing too! I love this Louise! You look lovely. I love that the print mixing doesn't look too "clashy" and I love your bag! I always used to think you looked lovely (even when it was our 9am Reading and Pop Culture class!) so I'd love to see more style posts! Haha aw thank you, coming from a successful fashion blogger this is a pretty awesome compliment! What a great pair of floral shorts the print is very flattering. I know what you mean by being conscious about things that are tight or too short I always get shorts that are pretty long or wear tights with them too! This is such a lovely outfit. I love the florals and stripes together!